Chiropractic is based on the scientific fact that your body is a self-regulating, self-healing organism, controlled by the brain, spinal cord and nerves of the body. The vertebrae, which protect the brain and nervous system, when misaligned or subluxated, causes malfunction of the tissues and organs throughout the body. Here at the Lumbar Yard, Dr. Sharon Bruce focuses on spinal health and wellness as the keys to overall health and well being. Because of the interrelatedness of the body’s various systems, chiropractic theory holds that spinal mechanics, including the vertebrae, corresponding nerves and soft tissues, play a primary role in the health of the whole body. The primary treatment for spinal dysfunction (spinal misalignment or subluxation) is a procedure known as vertebral adjustment, or spinal manipulation. A technique in which Dr. Bruce skillfully applies pressure to an area of the spine (or other joint) that is not functioning properly or is out of alignment. In addition to spinal manipulation, patients may also receive a treatment plan that uses physiological procedures. Patients progress will be carefully monitored and treatment will be modified to meet the patient’s changing condition. The choice of a health-care provider is a personal one. Research has shown that chiropractors like Dr. Bruce are well educated, make accurate diagnoses, and their patients are highly satisfied with their care. Considerable commonality exists between chiropractic and medical programs. Chiropractic education spends more time in basic and clinical sciences and nutrition, while medical education spends more time in public health. Little time in medical school is devoted to the study of the neuromusculoskeletal system and related health problems, which is a major focus in chiropractic education. Millions suffer needlessly from painful stiffness due to improper body posture forcing the spine out of it’s natural curved shape. When the spine has lost its natural curved shape, the discs are compressed and rich lubricating fluid is unable to penetrate. This causes premature aging in the form of stiff dry joints. Chiropractic allows nutrition to these stiff joints to increase movement and improved disc health. The Nelson Migraine Study compared chiropractic spinal manipulation to amitriptyline for the treatment of migraine headache. Researchers have found that spinal manipulation seemed to be as effective as a well-established and efficacious treatment (amitripytline), and on the basis of a benign side effects profile, and should be considered a treatment option for patients with frequent migraine headaches. An estimated 90% of men and 95% of women had at least one headache a year and about half of headache sufferers fail to seek treatment. This means a large number of those with headaches suffer needlessly or are self-treating with medications, neither of these solutions addresses the cause or causes of the headaches and, therefore, there is no preventions of future pain. Is Chiropractic Right For Your Children? Chiropractic management of pediatric conditions begins with an extensive physical examination and health history for the patient. While children may receive manipulation, also called adjustments, the techniques used are designed for use on children, they are not “scaled down” versions of manipulative techniques, the pediatric patient may receive physical modalities such as heat or cold applications, massage, or others as appropriate for the management of each case. Dr. Bruce can explain treatments and possible benefits. What Can Chiropractors Do for Auto Accidents? First, Dr. Bruce will assess the damage done to the most common injured site, the neck. Second, start treatment to avoid scar tissue from forming on the soft tissue, which if left untreated will cause chronic pain and weak muscles in the future. Specifically designed for sports medicine professionals, the InterX Sport combines interactive technology with a new user interface that provides immediate access to recommended stimulation patterns for a full range of sports injuries. The ability of the InterX to target specific areas of low impedance allows immediate access to highly effective treatment sites, enhancing the rate of recovery. Naturopathic medicine or natural medicine is an alternative medical system that focuses on natural remedies and the body’s vital ability to heal and maintain itself. Naturopathic philosophy favors a holistic approach and minimal use of surgery and drugs. A personal trainer is a fitness professional who develops and implements an individualized approach to physical fitness. The 5 classic components of fitness are muscular strength, muscular endurance, body composition, cardiovascular endurance, and flexibility. Although there are other subsets like power and speed. Nutritional advice provided to an individual patient by a dietitian, nutritionist, or doctor for encouraging modification of eating habits. Diversified technique (DT) is the most commonly used adjustment technique by chiropractors. Like many chiropractic and osteopathic manipulative techniques, Diversified is characterized by a high-velocity, low-amplitude thrust. Diversified is considered the most generic chiropractic manipulative technique and is differentiated from other techniques in that its objective is to restore proper movement and alignment of spine and joint dysfunction. The Activator Method Chiropractic Technique is a chiropractic treatment method and adjusting instrument used as an alternative to manual manipulation of the spine or extremity joints. The device is categorized as a mechanical force manual assisted (MFMA) instrument which is generally regarded as a softer chiropractic treatment technique. 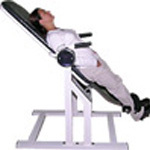 Uses a precision adjusting table with a weighing mechanism which adds only enough tension to hold the patient in the “up” position before the thrust is given. Inversion therapy involves being upside down or at an inverted angle with the intention of therapeutic benefits. Inversion therapy is a natural form of traction that uses your own body weight and gravity to decompress weight-bearing joints. While performing this strength exercise, the body is rotated and suspended, gravity’s force applies traction, resulting in a customized stretch that elongates the spine, increasing the space between the vertebrae, which relieves the pressure on discs and nerve roots. Less pressure means less back pain. Inversion stretch exercise may be best known as a method to relieve back pain, but it’s also an effective way to stretch and relax muscles, reduce stress and tension and provide healthy movement for ligaments.